The well is running dry for the classic Batman TV series toys that I wanted to pick up this year, but there are a few more coming down the pike that I am looking to buy. We've already seen the Batman and Robin 2-pack, Batusi Batman, Batmobile, and the first wave trio of Batman, The Riddler, and The Penguin. Fear not citizens! The Joker and Surf's up! Batman will coming shortly, but in the meantime, here's a few more items I am still looking forward too. Batman Action Figure based on the 1960s Batman TV Series. 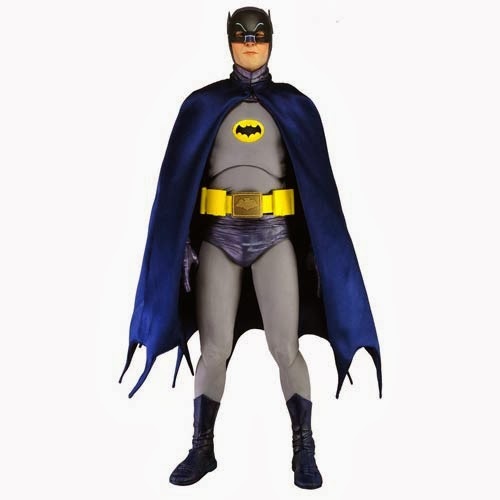 Poseable 18-inch tall figure features Adam West's likeness. Incredible detail and over 20 points of articulation. Includes a functioning utility belt, interchangeable hands, and more! If you've ever wanted an extra-large figure of Adam West from the 1960s Batman television series, here's your chance! This Batman 1960s TV Series Adam West 1:4 Scale Action Figure stands 18-inches tall and features over 20 points of articulation, plus a functioning utility belt, interchangeable hands, and more! This definitive action figure in actor Adam West's likeness is just about mandatory for anyone who grew up loving the original Batman television series. 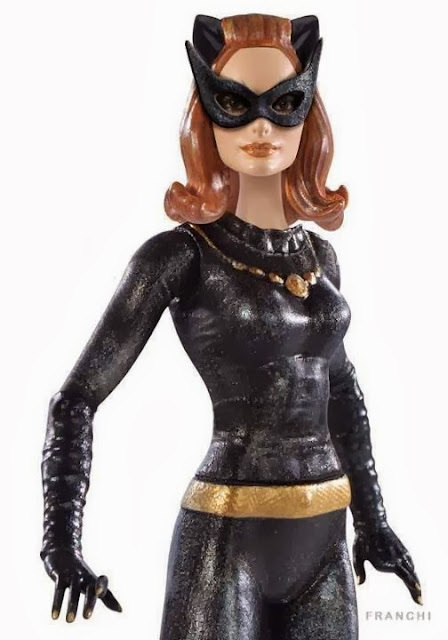 The upcoming 6" Classic Batman TV Series Catwoman figure based on actress Julie Newmar from Mattel will be released in October. 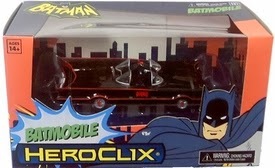 DC Heroclix Batman Classic TV: The Batmobile! The quintessential ride for the discerning Caped Crusader on the go, the Batmobile has been released in comic book stores everywhere along with the DC HeroClix: Batman Classic TV gravity feed display. It can be played on Autopilot for 75 points, Piloted for 145. Both versions can be played on theme teams using the Batman Family, Gotham City, and Vehicle keywords. Special Features specially crafted based on the image of Adam West as the iconic character Batman, featuring a screen-accurate masked head sculpt, specially made costume with Batman logo, weapons and accessories. “Holy smokes, Batman”! The crime-fighting hero of Gotham City is rarely seen without his faithful sidekick – Robin in the Batman 1960s television series. The campy and lighthearted TV show has become very popular with fans and a movie was made between the first and second season of the TV series. Hot Toys is delighted to introduce the 1/6th scale Robin Collectible Figure from the classic 1966 Batman movie. The collectible figure is newly developed and highly detailed which is specially crafted based on the image of Burt Ward as the boy wonder Robin, featuring a screen-accurate masked head sculpt, the classic Robin costume, weapon and accessories. 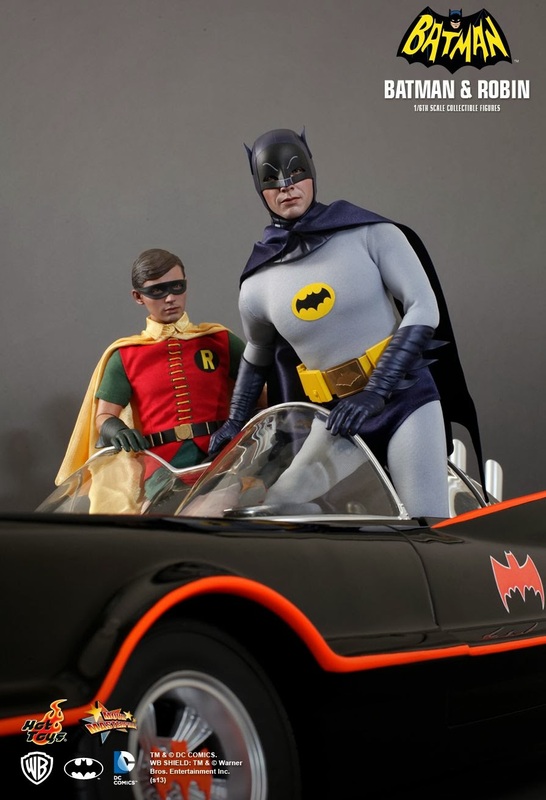 Special Features specially crafted based on the image of Burt Ward as the boy wonder Robin, featuring a screen-accurate masked head sculpt, the classic Robin costume, weapon and accessories. I was pretty bummed that this ride was slowing down, but as you can see there is plenty more where the rest came from. Stay tuned for more Batman TV series joy coming soon. I can't even find these in my area yet! But i will soon i hope and if not i will be going online to buy a few. As far as the upcoming stuff you shown John those Hot Toys Batman and Robin are simply amazing! Good luck John Boy. I don't think there much chance anymore of finding them in stores. Catwoman comes out in October, so, maybe then for a bit. Those Hot Toys Batman and Robin are "Hot." My super cool, yet non geek wife thought they were really Adam West and Burt Ward. Mego Museum was saying Mattel cancelled the line. Hope it is not true. I wish it wasn't Hobby. From what it seems after Catwoman that's it. Not to mention Yvonne Craig herself confirmed recently that she signed a licencing agreement to use her likeness, so there is sure to be plenty of Batgirl stiff coming soon! I was hoping for a Batgirl figure, but I think Yvonne held out too long. Maybe there will a Hot Toys Batgirl. I'd be happy with that, but I'm bummed Mattel will probably never make 6 inch Batgirl. Maybe we'll get lucky with a Barbie version. Cancelled! SHEESH! "You can tell it's Mattel" strikes again. I bet they release Batgirl in a super ultra hard to find rare and expensive Con exclusive. Because...Mattel. I really liked what Mattel did with this line and I had hopes that maybe they would make the right choice for a change, but once again my dreams of Mattel coming through were shattered. I give up. so far the only one i was able to get from the line is the riddler for had to wait till the new school year started and started earning my paycheck again. and only found the last riddler tru had it stock so have to play catch up. minus surfs up batman. too bad mattel canceled the line just when yvone craig finaly okayed her likeness to have batgirl get made. Yes, I still have hopes they may reconsider, but hopefully there will be some cool Batgirl items of some sort come about in the end.